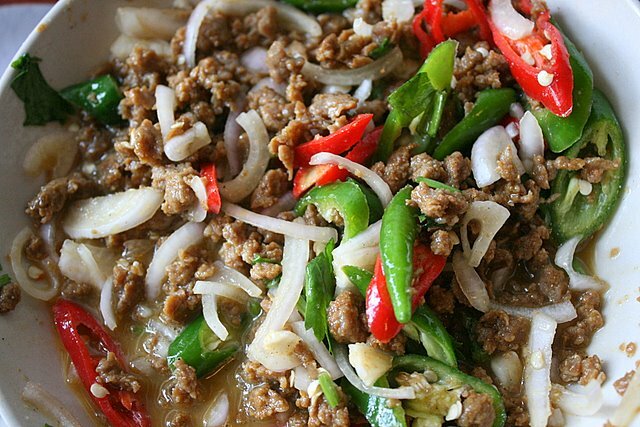 Some hawker foods are tasty but so greasy, it makes sense to prepare your own at home. 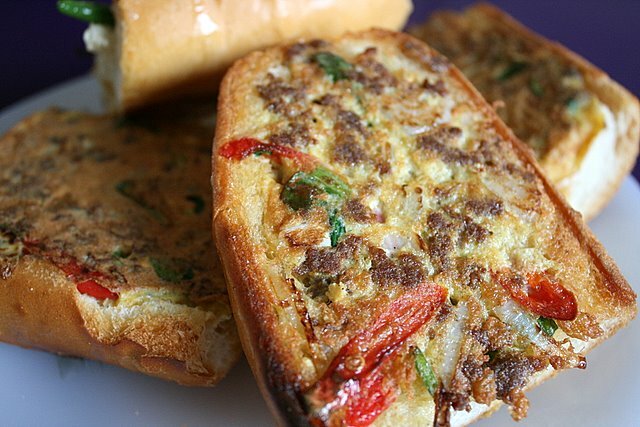 Roti John is possibly one example. This spicy mince-onion omelette fused on a French loaf often absorbs so much oil (possibly ghee) during the frying process, you can feel your arteries screaming for help. I have tried the version at the Shukor stall formerly from Taman Serasi, which claims to have invented this dish in 1975, and is now a Makansutra Legend. But I think they lost something along the way when passing down the recipe to the newer generation. We decided to make our own at home, and it turned out not only healthier but more delicious. Best of all, it's really fast and easy! Out of curiosity, we tried frying without oil at first in a non-stick pan, but the result is a very light-coloured pasty thing (see pieces in background). A little bit of oil gave the GBD (golden brown and delicious) effect (see top slice). 5. Enjoy with chili or tomato sauce or both! Next time I am going to try it with some cheese in the mixture! Mmmh! Agree with you that the roti john outside are so oily. Yours look so much healthier. Looking forward to read your review on "Aburiya". That looks delicious! I loved to eat roti johns since young and it sounds bento-friendly. Maybe I should make some for my bento next week. Thanks for the idea!